Sophomore basketball player Harlee Willoughby, was shaped through various experiences throughout her life. She came to USU Eastern from Delta, Utah. She attended Delta High School where she played basketball, volleyball and also a year each of softball and track. She was also a part of the seminary council. Willoughby’s childhood was full of outdoor adventures. She grew up on a farm with all sorts of animals and plants. Her family owns Belgian horses which they use to farm with, pigs, chickens, turkeys and dogs. When Willoughby drives into her farm, she rolls her window down and gobbles at her turkeys. They always gobble back to her. An evil rooster lives at her house and singles Willoughby out of the rest of her family as the one to chase. Willoughby had to throw a pitch fork at it in order to protect herself during one close call. If Willoughby could have any pet in the world, she would have a teacup pig because they stay small forever. She has always wanted one. Gardening was another activity that made up Willoughby’s childhood. Her family grows an enormous garden every year full of all types of plants. At one point when the tomatoes in her garden rotted, Willoughby and her friends had a tomato fight. “It was like a paintball fight, but with homemade ammunition.” Willoughby and her friends also liked to build forts, drive motorcycles over jumps and play airsoft wars. If Willoughby could go back to a time in her life, she would go back to her age and situation of life right before high school. During this time, Willoughby’s family had many family reunions, and “nobody was married or had any stress from high school.” She was close to her cousins and considered them some of her best friends. An unknown hobby that Willoughby has is driving a horse buggy and sewing. She particularly likes to sew blankets, with help from her mom, she can sew clothes. The biggest influence anyone has had on her life is her younger sister Sunny. She was born with a condition called arthrogryposis which disabled her from being able to walk. Her muscles and bones didn’t develop completely and her tendons were too tight. Despite her situation, Sunny keeps a bright attitude and is happy all the time. Seeing how happy her younger sister is no matter what, makes Willoughby appreciate her own life and keep a cheerful spirit in her times of trial. Willoughby has had her own set of obstacles and hardships she has had to overcome. 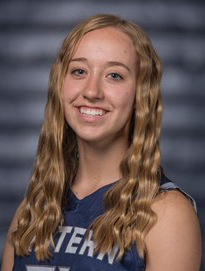 Coming into her freshman year at USU Eastern, she was recovering from a broken foot. It was caused by a stress fracture left unattended. She was running track at the time and ran through the pain because she didn’t think it was serious. She eventually went to the doctor and discovered it was broken. When Willoughby finally recovered from her broken foot and 100 percent cleared to play, she broke her pinky trying to rebound the ball during a tournament in Las Vegas. She wasn’t going to tell her coach that she broke it. Another player spotted it and immediately made it known. Her pinky was broken in a few places. Willoughby was determined to make a quick comeback and learned to play with a cast. After a few games however, she caught the swine flu and was forced to miss another game. Over Christmas break, Willoughby got a PET scan to figure out a stomach issue she had been dealing with throughout her entire life. However, she was allergic to the dye used and got hives both inside and out. Through all of these hardships, Willoughby kept a good attitude. She realized that she can do hard things, and remembers the important things in life. Willoughby cares about people and wants them to be happy. She sees people having hard times and wishes she could take on their burdens for them. She wants to see everyone happy. She admires when people are bubbly and happy all the time. These traits are also reflected in her personality. Willoughby always has a smile on her face and can light up the room with her cheerful spirit. She is optimistic enough to laugh at herself. She is resilient in that she never gives up and can push through the toughest of times.